Lawsuits challenging the disproportionate effects of government decisions on low-income and minority communities are on the rise. Studies show that low-income families and racial minorities are more likely to suffer from health issues related to pollution. Grassroots environmental justice groups are increasingly fighting the siting of Locally Unwanted Land Uses (LULUs) in low-income and minority communities. The principles these groups adopt are good planning principles: that no person or neighborhood should be burdened by harmful environmental conditions and that all persons should have the opportunity for meaningful participation in the decisions affecting the health, safety, and identity of their community. 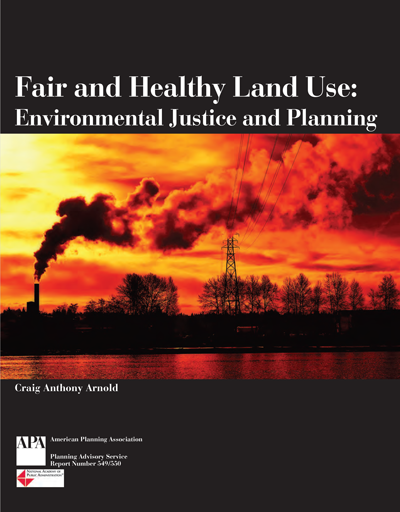 This report from APA's Planning Advisory Service explains how the principles of environmental justice can be incorporated into land-use planning processes. Chapter 1. Environmental Justice: What Is It? What Is the “Environment” in Environmental Justice? What Is the “Justice” in Environmental Justice? Are There Disparities? Why Do They Exist? What Impact Does Environmental Justice Have on Public Policy and Law? When Is Environmental Impact Assessment Appropriate?